Amazon Prime Day is upon us. Cancel all your plans, move all your scheduled meetings, and get a babysitter because this year is on par to outpace the last, which broke records as Amazon’s biggest sales day ever. And mama’s itching to steal some deals! 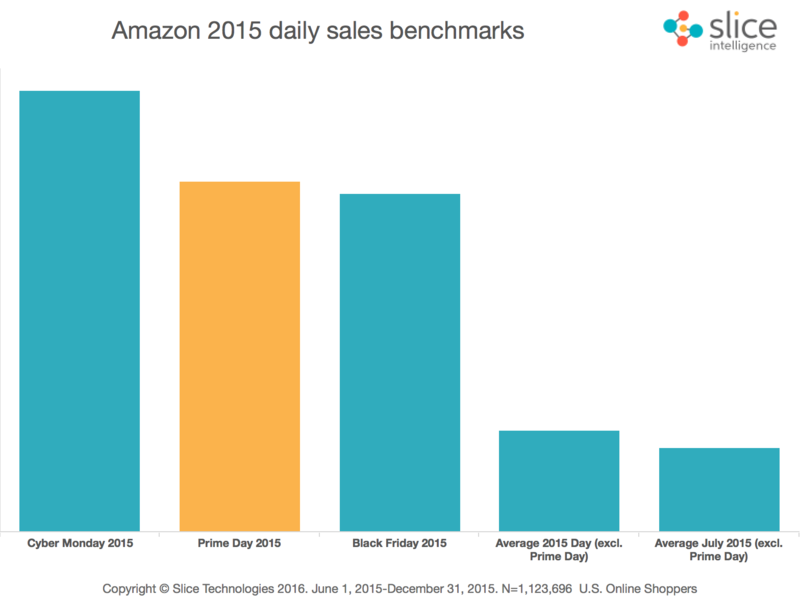 In fact, back in July of 2015, on its inaugural Prime Day, Amazon reportedly sold more units than it did the previous Black Friday! We still see you, Cyber Monday. Point being, Amazon literally up and created their own holiday and in its first year surpassed the infamous tradition of stomping over other’s loved ones for decently priced electronics the day after sitting down to give thanks. Amazon Prime has an estimated 80 million memberships, meaning more people have Prime memberships than votes cast for Donald Trump (or Hillary Clinton) in the 2016 presidential election. There are also two times as many Americans with Prime memberships as there are residents of Canada. Amazon Prime is set to have more members than cable TV. Amazon Prime brought in $6.4 billion in 2016 (more than Yahoo!’s total revenue), making it a FORTUNE 500 company on its own. 90,000 tv’s sold later and retailers across the country are asking how they can compete and turn a profit during the holiday season (and beyond) without feeling the weight of a massive goliath such as Amazon towering over them and their bottom-line revenue. Given Amazon’s insane advantage in economy of scale, competing with the Goliath on the basis of convenience and price is often a losing proposition. Prime Day is the ultimate manifestation of this. So, how does a retailer compete? You have to get personal. And, thankfully, you don’t need to be Amazon in order to get personalization right. Fostering a personal connection in your offering boils down to communicating the right message, based on the each customer’s unique needs and expectations. This can be done by dynamically displaying incentivized notifications and overlays based on first and third party data retailers collecting on each shopper. Engagement notifications – Display custom promotions, marketing offers, or incentivized coupons in real-time. 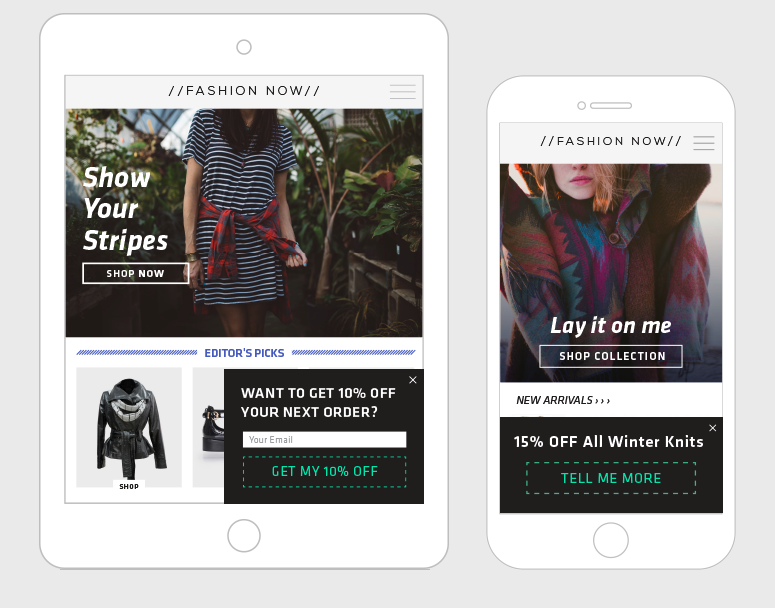 Behavioral Exit Intent Messages – Trigger exit intent popups according to visitor context. Demand Messaging – Surface real-time notifications based on user activity, including low-on-stock messages, location-based view counters, or trend alerts. Mobile App Messaging – Engage mobile users with 1:1 app notifications. Customers quickly recognize (and ignore) blanket promotions that fail to convey a personal attachment to the product on display. Tailoring relevant and engaging messages to match individual preferences proves an organization’s ability to cater to needs on a personal level and maximizes purchase likelihood. Identifying a given user’s device type is crucial in understanding purchase intent and providing the most relevant offerings to suit it. Strategy 1 – Detect devices shoppers are using and tailor offers according to advanced segments such as product affinities, geo-location, age, demographics, and date of first visit. If a given user has an affinity for sweaters, knowing that they are an 18-year-old shopping from an iPhone in North Carolina can make all the difference when creating a compelling offer. 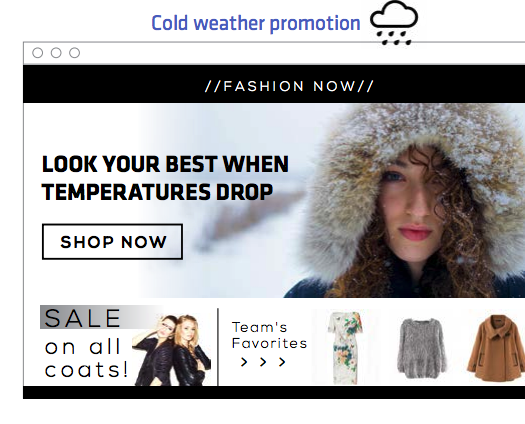 Additionally, weather targeting to users is especially critical for retail brands with large seasonal product catalogues. Promoting the right seasonal products to the right users is a surefire method of gaining a competitive advantage and increasing the average value of orders. Weather plays a vital role in shaping consumer behavior and opens up a highly-relevant avenue to influence decision making and increase conversions. Strategy 2 – Personalize experiences for consumers using smartphones to look up products in or around your brick-and-mortar store. First, merge activity data to determine the products shoppers are engaging with on their smartphones. Then, broadcast beacon offers to them via bluetooth with special incentives to purchase those items in-store. 74% of sales are lost from shopping cart abandonment, and effectively communicating highly incentivized marketing messages is key to recovering potential abandonments in real-time and inducing re-engagements with your customers. Time is of the essence as cart abandonment emails sent within the first hour of abandonment perform best. 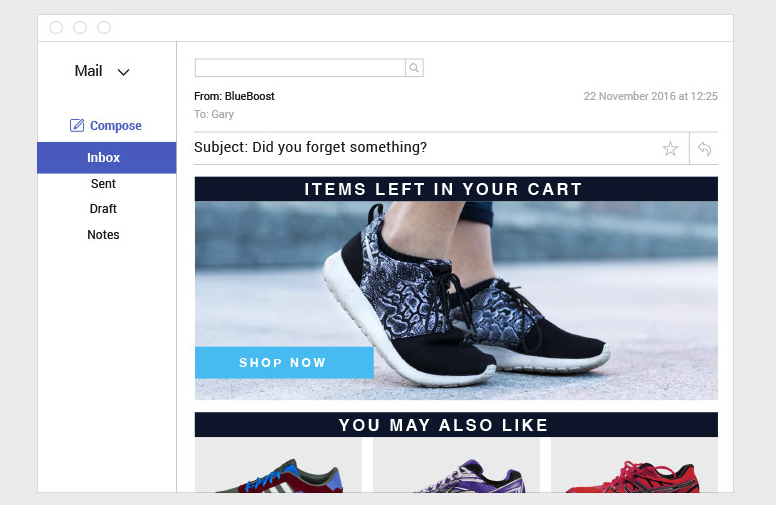 Retailers can set up campaign triggers to send emails instantly after a cart is abandoned with personalized product recommendations and incentives urging visitors to complete their purchases. Regardless of the reasons that shoppers abandon their shopping carts, there’s a very limited win-back window. Companies won’t stay on top of if their strategy is to copy Amazon, but they can compete with Amazon by connecting their customer data and using it to serve consistent, memorable, and most importantly, personalized experiences across all channels and devices. And with the right technology, the strategies highlighted above are only a fraction of what can be accomplished.